Discount rate which captures the business risk. Discounted Cash Flow is considered the most accurate business valuation method. Its strength lies in business value estimation based on the precise match between the business earning power and risk. You can accurately determine the value of any business – large or small – using this powerful business valuation method. This is the tool of choice for valuing both the established businesses and start-ups – since it works directly on the business earnings forecasts. High growth businesses or firms with significant earnings upside are particularly well suited for business valuation using the Discounted Cash Flow method. The example below shows how to value a business by discounting its cash flow. 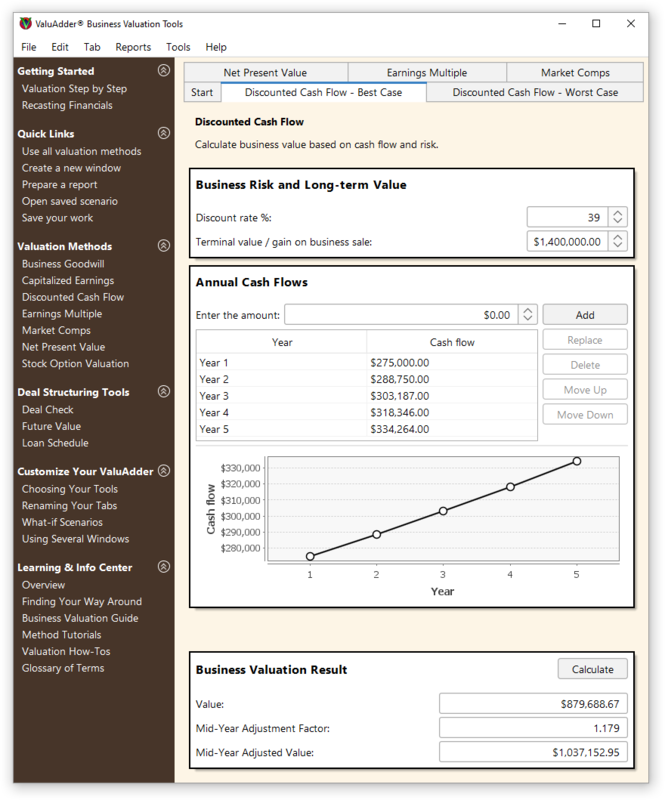 First, you use the recast business financial statements to estimate the cash flows 5 years out. Next, the disount rate is built up, representing the company risk profile. Finally, you estimate what the business will be worth at the end of the 5-year forecast – an expected gain if the business is sold then. Varying your assumptions changes your inputs and affects your business valuation results. You can easily do what-if scenarios. Each scenario should reflect the possible business outcomes – and how they translate into business value. Use the Discounted Cash Flow method as a strategic planning tool. Make the right business decisions and increase your business worth!